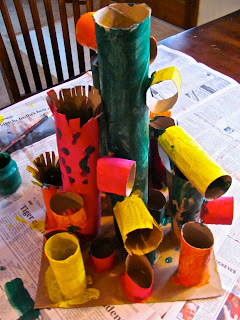 The Chocolate Muffin Tree: Recycled Paper Tube Sculpture! This is My Favorite Post from 2011, I've included the blog hop at the end of this post to attach your own favorite post if you are a Blogger! Check out all the other Favorite/Best Posts too! 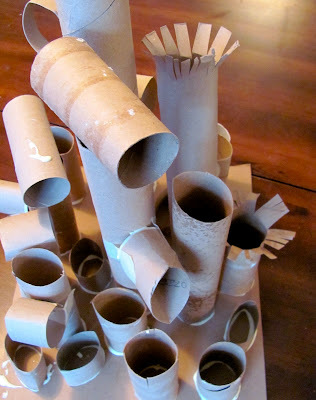 As I said before, we've been collecting a lot of paper tubes and trying out projects with them. It is amazing how many tubes you can collect in just a month! Recycled arts and crafts are really the way to go and inexpensive. 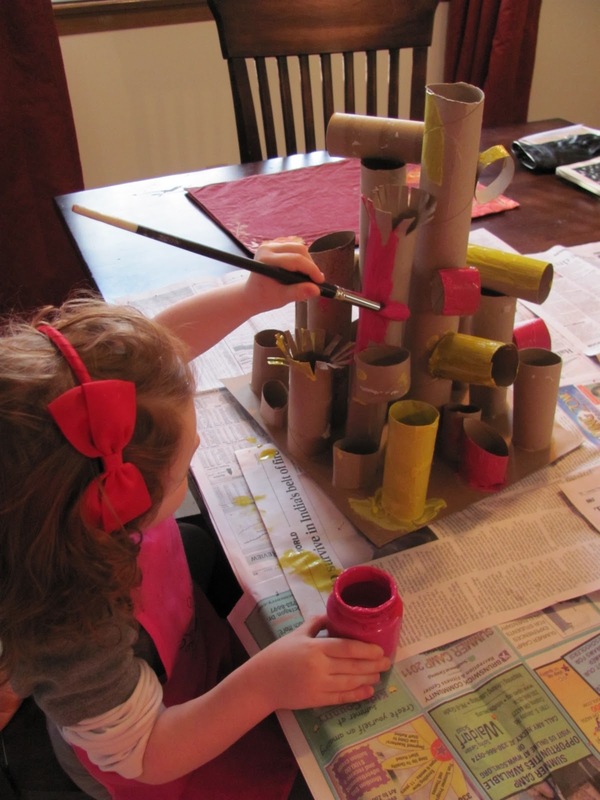 My daughter and I created a Tube Sculpture and it turned out really cool! We could add other things to it, but I think it will stay like this for a while until we think of something to add! Any ideas? So the first thing we did was collect some tubes and lay them all out to see what we had. Then I started cutting some into smaller sizes and my daughter enjoyed fringing out some of the tubes. Tubes are too difficult to cut for preschoolers. Older kids may be able to cut them! We used a piece of cardboard from a gift box for the base of the sculpture. Then we started gluing the tubes to the cardboard base. 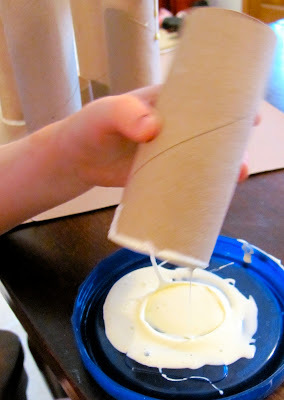 I put white glue in a recycled jar lid and we dipped the ends of the tubes carefully making sure to shake off excess glue!!! I reminded my daughter that you need to let the tubes dry because they will not stick right away. To stick tubes sideways or on top of other tubes I used some tape to hold them on and then removed the tape after the sculpture was dry. This part was a lot of fun!!! We let this part dry for a day. After we let it dry, we painted our sculpture. Cassie wanted to paint it right away (that night), but she waited! We painted one color at a time. I think this helped to focus her attention instead of giving her a million colors at a time! We really enjoyed building the sculpture the most! Painting is always fun, but my daughter is a clean freak and has to wash her hands after any bit of paint on her! FInished for now! Maybe we'll add some pipe cleaners?? I had all these wonderful comments and now they are deleted ) : ! So very sad! @Christie Thanks so much! Thanks for stopping by! This is the coolest idea I've seen in a while. What a great finished sculpture it made! This is a beautiful art project. I love the way your daughter has put so much thought into the placement and colour. Stopping over from we play. Hi Rachelle----it was great fun! I will gladly link this project up! Thanks! I'm saving for another project too! My kids would love this one!! So fun!!! I am feeling inspired to raid the recycling bin before garbage day tomorrow! Thanks for the linky party I love seeing what other people have been doing this year. We need to do more sculptural art in our house, and this is perfect for little hands. Happy New Year!